BEYOND their stated or implicit concerns, movies in some way always reflect the times in which they were made. And films about World War I are no exception. In the century since the start of the war, variously commemorated throughout Europe and the US this summer, the conflict has often been portrayed on screen — represented at different times as either a misguided enterprise or a glorious cause. Less appreciated is the Great War’s use as propaganda tool as new hostilities arose throughout the 20th century and into the present one. Such pictures shed light not only on how the war itself was perceived at different points following its conclusion, but also on the manner in which subsequent generations bent the narrative to their own purposes. The most popular film about the war made before the armistice was Charlie Chaplin’s “Shoulder Arms” (1918), a comedy. But more serious treatments soon followed, including Rex Ingram’s anti-war epic “The Four Horsemen of the Apocalypse” (1921), which made a star of Rudolph Valentino. Its central conceit, a single family divided by members fighting on both sides, would also figure prominently in John Ford’s “Four Sons” (1928). But the film that best synthesized American feeling about the conflict in the decade following it was King Vidor’s “The Big Parade” (1925), among the greatest pictures documenting this war thanks to its sweep (from the home front to the Belleau Wood and back); its often breathtaking cinematography (thousands of extras were used at key moments); a subtle and sympathetic star turn by the matinee idol John Gilbert; and its sophisticated handing of the conflict’s varied aspects — reflexive patriotism, the horrors of battle and, finally, a perspective on the war’s toll after the shooting ends. Several outstanding war pictures of the 1920s centered on aerial combat, particularly William Wellman’s “Wings” (1927), winner of the first best picture Oscar; “Hell’s Angels” (1930), produced by Howard Hughes and featuring Jean Harlow in her first major role; and Howard Hawks’s “The Dawn Patrol” (1930), starring Richard Barthelmess and Douglas Fairbanks Jr. Like “The Big Parade,” “Wings” and “Hell’s Angels” incorporated romance into their storylines of airborne heroics. Not so the all-male “The Dawn Patrol,” which won an Oscar for best story and plumbs issues of personal responsibility in wartime. 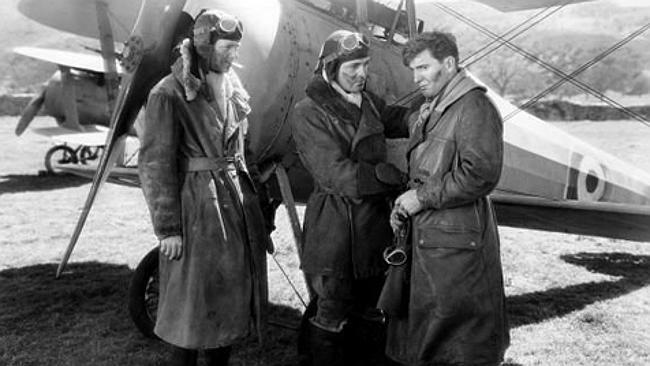 Though the film celebrates the derring-do of its British fliers, it also takes a nuanced look at the men who, duty-bound, send their comrades to virtually certain death and then must deal with the guilt such actions provoke. The film was remade in 1938 in response to the Anschluss, under Edmund Goulding’s direction and starring Errol Flynn, Basil Rathbone and David Niven. And what this later version loses through its distance from the Great War, it more than makes up for in slicker production values and a dashing cast. The near decade between the two versions of “The Dawn Patrol” saw the perfection of a different type of war movie, one unequivocally pacifist in nature. 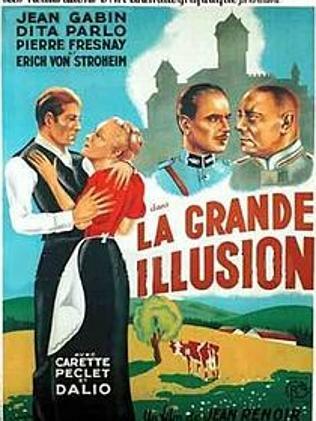 The most internationally celebrated and sophisticated of these is Jean Renoir’s classic “La Grande Illusion” (1937), whose title says it all. With its multinational cast and a worldview more universal than any similar picture, its hold on the public imagination remains strong after nearly 80 years, and rightly so. Far less famous, though no less potent, is Raymond Bernard’s “Les Croix de Bois” (1932), or “Wooden Crosses.” Its cast composed entirely of veterans, the film charts the gradual disillusionment of a French soldier (the excellent Pierre Blanchar) as his regiment thins and the war drags on. In addition to a tense episode in which the enemy Germans lay mines beneath a French trench, the movie features an extraordinary battle sequence that runs an unremitting 15 minutes and stands among the screen’s most harrowing. But as the remake of “The Dawn Patrol” suggests, feelings regarding the war began shifting as this decade concluded, thanks to the simultaneous rise of Nazi Germany and imperial Japan. On its surface, “The Fighting 69th” (1940), starring James Cagney and Pat O’Brien, celebrates the achievements of a storied New York regiment long associated with Irish immigrants. But the film is really a morality tale, in which Cagney’s loudmouth Jerry Plunkett transforms from coward to hero under the patient guidance of O’Brien’s Father Duffy, whose monument still stands in Times Square. And though personal weakness is not an issue in Hawks’s “Sergeant York” (1941), for which Gary Cooper won his first Oscar, overcoming a religious commitment to nonviolence is. The real-life Alvin C. York, a celebrated Medal of Honor winner, was a conscientious objector who ultimately chose to fight and was thus perfect for a cinematic object lesson that had its premiere months before Pearl Harbor. With attention in the 1940s focused on World War II and depictions of it mounting on screen, movies about the previous war predictably declined. Not till Stanley Kubrick’s “Paths of Glory” (1957), loosely based on a novel from 1935, did the Great War surface again in a major way. Starring an impassioned Kirk Douglas as a French army officer-lawyer attempting to defend three enlisted men wrongly accused of cowardice, the movie trains a gimlet eye on the war’s soulless bureaucracy and its amoral stewards. Joseph Losey’s more cerebral “King & Country” (1964) treads similar ground more subtly — with Tom Courtenay as a soldier accused of desertion and Dirk Bogarde as the British army captain who defends him. But as the conflict in Vietnam intensified during the mid-to-late 1960s and early 1970s, films relating to the First World War took a curious turn — overt in their blanket opposition to armed conflict but also grounded in whimsy, satire and fantasy. Elements of burlesque coloured films like Philippe de Broca’s “King of Hearts” (1966), starring Alan Bates as a British soldier who enters a French town in which the only inhabitants are escaped lunatics, posing a rather obvious metaphorical question about what really constitutes madness; Richard Attenborough’s version of the musical “Oh! What a Lovely War” (1969), with cameo appearances by nearly ever major British actor of the era; and Dalton Trumbo’s “Johnny Got His Gun” (1971), with Timothy Bottoms as a doughboy who has been spared death in the trenches only to have his extremities amputated. More conventional views of the conflict arrived with films like Peter Weir’s “Gallipoli” (1981), which helped bring Mel Gibson to international attention. Here, the war serves as a backdrop for emerging Australian nationalism, as well as a plea for the sparing of innocents. And pictures made more recently have continued to examine the war’s margins, including two French movies — Bertrand Tavernier’s “Life and Nothing But” (1989), starring Philippe Noiret, and Jean-Pierre Jeunet’s “A Very Long Engagement” (2004), with Audrey Tautou — each concerned with recovering the missing-in-action (living and dead) immediately after the war. Most recently, an unsettling sentimentality has crept into cinematic depictions of this war, specifically the multilingual French feature “Joyeux Noel” (2005), nominated for a foreign-film Oscar, which offers a fictionalised account of the ad hoc Christmas “truce” of 1914, and Steven Spielberg’s “War Horse” (2011), in which an equine of extraordinary grit displays more “character” than many of its misguided human masters. The driving force in movies like these sounds appealing, but it is also naive — much as we’d like to believe that more connects us than divides us. Alas, history proves otherwise. And though history can seem circular, it is also linear. The guns of August began firing a century ago, and the memory of them — even as revived on film — grows more distant each year. Now, with the Great War’s participants all dead, and even their children aged, the conflict’s presence in the public imagination will only wane further, its many truths animating our screens less frequently.